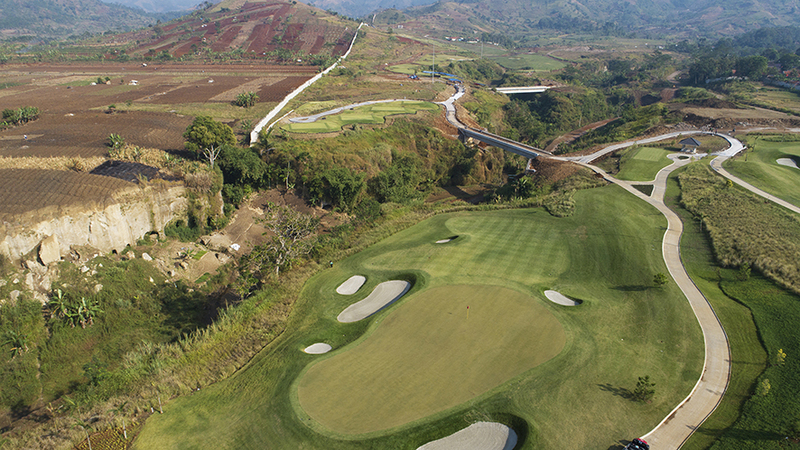 The beauty of golfing in Indonesia is that you’re never far away from a fabulous golf course. Moreover, the majority of Indonesia’s top golf courses are of world-class, and yet, there are no strict club rules and regulations like there are at many top golf courses in the UK or in the USA. Rest assured that, in Indonesia, there is no stiff-upper-lip attitude that stands in the way of an enjoyable day out on the golf course. In Indonesia, golfing is pure fun! 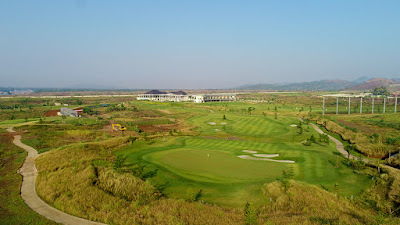 Furthermore, a significant amount of Indonesia’s top golf courses are conveniently located in, or near an exciting city. And for those who are looking for “awe-inspiring beauty”, it’s good to know that a great deal of Indonesia’s top golf courses is located in some of the most stunning and natural sites not too far away from the hustle and bustle of a grand city, or from a modern-day urban development. Playing golf aided and accompanied by a charming and knowledgeable female caddie, is yet another amenity that is part and parcel of the fun of playing golf in Indonesia. And if all of this isn’t enough, playing golf on Indonesia’s top golf courses during weekdays is highly affordable and doesn’t necessarily mean that you have to break bank. Needless to say, that all of the above accolades contribute to Indonesia’s meteoric rise as one of Asia’s most attractive golf destinations. Talking about beauty; recently I traveled to Bandung to get a sneak peek at yet another quality golf course that will surely elevate Indonesia’s - and in this case, Bandung’s reputation as a highly attractive golf destination. Located in Kota Baru, Parahyangan, Padalarang, very soon a brand new 18 holes golf course will open under the name of Parahyangan Bandung Golf. It was designed by Bob Moore - lead designer of USA-based JMP Golf Design Group, and the man who delivered top golf courses such as Royale Jakarta, Rainbow Hills and Senayan National in Jakarta, Bukit Pandawa in Bali, and Padi Valley in Makassar, to name just a few. Set amidst a highly dramatic valley-to-mountain landscape located beyond the modern township of Kota Baru Parahyangan, Padalarang, uniquely, the golf course navigates through two distinctly different types of terrain. From the more than 9000sqm open-spaced clubhouse, the front nine sets out from the valley into an awe-inspiring mountainous landscape that is dominated by steep hills and mountains, and that is home to ravines and deep gorges created over a period of thousands of years by weathering and erosive activity. As it plays high above the valley in which the clubhouse and the back nine are located, many holes on the front nine offer stunning views, and particularly the view from the tee box of the downhill par 5 hole #5 is exemplary. The steep hills and mountains are home predominantly to local farmers who make a living from agriculture and vegetable farming. Seamlessly their workspaces integrate with golf holes that are situated in this part of the site, and of which several are still under construction. The back nine sets out into an open plain that borders Lake Saguling, a man-made lake that forms a rich source of income to fishermen and fish-farmers alike. The main activity on the lake’s shores is vegetable farming and growing of rice, the latter being the most widely consumed staple food in Indonesia. Lake Saguling’s many tributaries and waterways have created a patchwork of typical landforms with shoreline-features that include plateaus, bays, gorges and streams, and tiny valleys even. And it is here, that Bob Moore cleverly created a series of golf holes - #12 to #16 - that connect and/or integrate these amazing landforms and shoreline features, making room for golf holes unlike anything we find elsewhere in Indonesia. Whether it’s the front- or the back nine, the set-up of the entire golf course is incredibly “vast” and “spacious”. It is nothing short of phenomenal. Literally each and every hole offers a different vista that surely will have you struggle for concentration, and to take it one golf shot at a time. Without doubt, Parahyangan will leave an indelible impression with first-time visitors and seasoned golfers alike. After what I have seen at Parahyangan Golf, for me it’s pretty obvious; the Parahyangan golf course is testament not only to Moore’s unconditional love for his trade and for Indonesia’s natural beauty, but certainly also for his unwavering respect for all that Mother Nature throws at him as a golf course designer. Rest assured that with the Parahyang golf course, Bob Moore is about to deliver one of his “very best”. 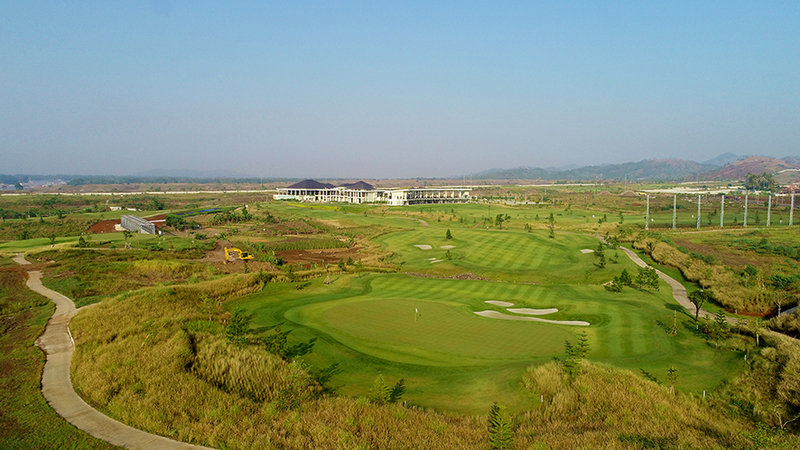 In order to share my first impressions with Golf Asia readers in Indonesia, here is a photographic sneak peek into what the brand-new Parahyangan golf course has in store for all golfers who love beauty, drama and challenge, all wrapped-up in one. During my two-day visit at Parahyangan, no score card was available yet. So, unfortunately, I am not able to give you details on distances and slope- and course ratings. As soon as I have all of this information, we will surely publish it in one of Golf Asia’s upcoming editions. Usually, in Indonesia, lady golfers play a minor role in amateur golf tournaments. Mostly these tournaments are dominated by men participants. However, this morning, 8 December, 2016, uniquely, and for the very first time, golfing ladies in Indonesia were competing in an "all ladies" golf tournament, and in which men were excluded and thus played no role at all. Organized by Mercedes Benz Indonesia and promoted by Image Dynamics under the all encompassing title SHE'S MERCEDES LADIES GOLF TOURNAMENT 2016, the tournament was held at the Pondok Indah Golf Club. It was officially opened by Mercedes-Benz Distribution Indonesia President & CEO, Roelof Lamberts. Every picture attached here tells a unique story, and no one seems to have any doubt that this (rather unique) initiative may well become a yearly fixture on the Indonesia's amateur golf tournament calendar. Bogor, Indonesia, November 26 - American John Catlin closed with a second consecutive four-under-par 67 to seal his maiden Asian Development Tour (ADT) victory at the Combiphar Golf Invitational on Saturday. The 26-year-old Catlin, who started the day with a two-shot lead, sank four birdies against no bogey to claim a three-shot triumph with a 16-under-par 268 total at the Gunung Geulis Country Club situated in Bogor city. Micah Lauren Shin, also of the United States, fired a 65 to grab a share of second place with Filipino stalwart Antonio Lascuna, who closed with a third straight 68, at the inaugural US$60,000 ADT event. American Sam Cyr took fourth place on 273 following a 70 while Singapore’s Mitchell Slorach returned with a 71 to settle two shots back in fifth at the Combiphar Golf Invitational, which is the Tour’s second stop in Indonesia this season. “This win means so much to me. I have been through a lot in my life both personally and as a professional over the last three years so it means a lot to finally win,” said the Bangkok-based Catlin, who turned professional in 2013 and is playing in his second year in Asia. Catlin continued his overnight lead by nailing two straight birdies on the front to turn in 33. He sank a 20-foot breaking putt for birdie on 15 but was tied for lead with his fast-charging playing partner Lascuna on 15-under with three holes to play. Catlin, however, kept his cool and regained the outright lead straightaway following a two-shot swing for birdie on 16 as Lascuna stumbled with back-to-back bogeys. “I just kept it the same as the last three days. I just stayed patient out there. I am glad it paid off,” added Catlin, who took home the winner’s prize purse of US$10,500 and received six Official World Golf Ranking (OWGR) points courtesy of his win. 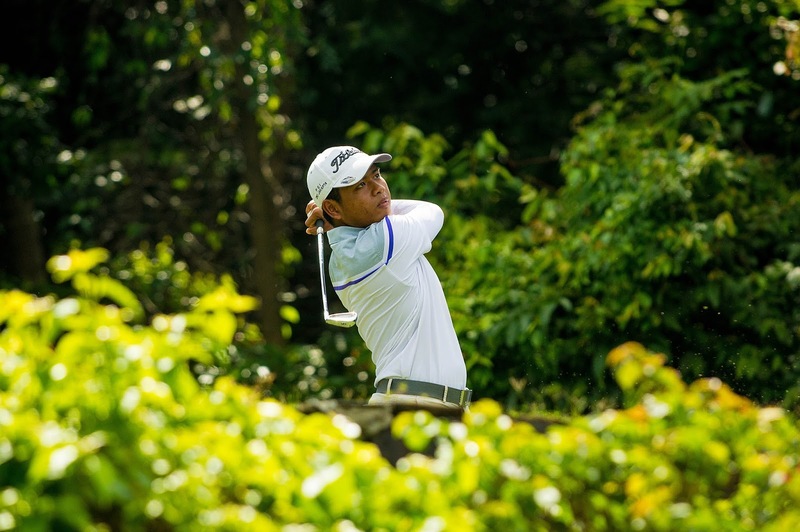 Indonesian amateur Naraajie Ramadhan Putra claimed the low amateur title by maintaining his nerves and putting in another solid round to finish in a tie for 16th, together with Danny Masrin who scored a lowest score of the day 65 in his final round. Bogor, Indonesia, November 25 - American John Catlin holed a pivotal birdie putt on the last for a four-under-par 67 to lead by two shots in the penultimate round of the Combiphar Golf Invitational on Friday. Catlin, who started the round with a one-shot deficit, marked his card with five birdies against a lone bogey to sit atop the leaderboard on 12-under-par 201 total at the Gunung Geulis Country Club situated in Bogor city. His compatriot Sam Cyr posted a solid 65 to share second place with Filipino stalwart Antonio Lascuna, who returned with a second consecutive 68, at the inaugural US$60,000 Asian Development Tour event, which is the Tour’s second stop in Indonesia this season. Overnight leader Mitchell Slorach of Singapore slipped to fourth place on 204 following a 71 while Thailand’s Panuwat Muenlek, who is chasing for a third win this season, settled a further shot back in fifth after carding a 68. “It was a grind but I stayed patient and kept it going out there. The conditions were pretty similar to yesterday. I made a nice breaking putt on 18 from 15 feet to finish with a birdie. That was my highlight today,” said Catlin. “I will keep everything the same tomorrow. I just need to stay patient,” added the Bangkok-based 26-year-old, who is searching for a maiden win on the secondary circuit, which was launched in 2010 as a gateway to the region’s premier Tour. “I was able to hit it close a few times today. I like the way I am striking the ball. I left myself in good places to be aggressive on my putts as well. I made seven-footers on sixth and 16 and sank a 13-footer on 10,” said the 30-year-old Cyr. Best of the local players is amateur Naraajie Ramadhan Putra, who scored a third successive sub-par round and is currently in a T19 with 5-under-par. He's one shot ahead of Ian Andrew who's in a tie for 26th after carding a 73. Bogor, Indonesia, November 24 - Singapore’s Mitchell Slorach soared into the lead after signing for a superb eight-under-par 63 at the halfway stage of the Combiphar Golf Invitational on Thursday. Starting the day three shots back, the 29-year-old Singaporean fired 10 birdies against two bogeys to lead by one shot on nine-under-par 133 total at the Gunung Geulis Country Club situated in Bogor city. 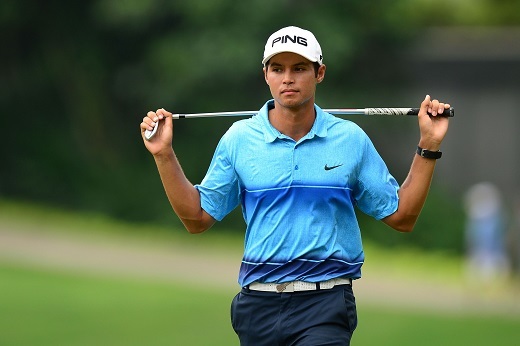 American John Catlin returned with a 64 to take second place while Filipino stalwart Antonio Lascuna sits a further shot back in third after posting a 68 at the inaugural US$60,000 Asian Development Tour event, which is the Tour’s second stop in Indonesia this season. Micah Lauren Shin, also of the United States, signed for a 67 to take fourth place on 136 while Thailand’s Panuwat Muenlek and Raphael De Sousa of Switzerland shared fifth on 137 following identical 69s. Slorach fired two opening birdies from 10 before dropping a shot on 12. He made it up right away with a birdie on 13 and nailed three straight birdies from 16 to turn in 31. He then added two pairs of birdies against a bogey on his way home for a 32. “I struck the ball great and I putted very well. I missed only one fairway today and I hit 17 greens in regulation. I hit it close and I was able to give myself chances to make birdies today. “I played with no expectations. I went out feeling calm and I stayed calm throughout the round. I managed myself well,” said Slorach, who enjoyed his best result on the ADT when he finished runner-up in the last event in Malaysia two months ago. “The conditions are very wet. It will be a huge bonus if you can get on the fairways, given the preferred lies in play. I played pretty much the same as I did yesterday except that the putts went in today,” added Slorach. Catlin credited his short game for a commendable round. “I putted very well. I gave myself a lot of birdie putts and my short game was on point as I only missed a few greens. I made a couple of 20-footers and sank most of the putts from five to 15 feet. I was rock solid,” said the Bangkok-based 26-year-old. “I chipped it in from about 30 feet for eagle on 16. It was an uphill chip. I played aggressively and it went in. I went on the birdie the next hole and it was nice finishing the way I did. I will continue to stay patient. There is still a long way to go,” added Catlin, who traded an eagle and seven birdies against two bogeys. The halfway cut was set at three-over-par 145 with a total of 59 players, including 12 Indonesian, advancing into the weekend rounds. Bogor, Indonesia, November 23 - Tour rookie Kevin Techakanokboon and Filipino stalwart Antonio Lascuna fired identical four-under-par 67s to share the lead in the opening round of the weather-disrupted Combiphar Golf Invitational on Wednesday. The inaugural US$60,000 Asian Development Tour (ADT) event was suspended for over two hours in the afternoon due to lightning threats before play was abandoned at 6pm local time due to fading light. A total of 45 players returned on Thursday at 6.15am local time to complete their rounds at the Gunung Geulis Country Club in Bogor, a city in the West Java province of Indonesia. The second round has commenced at 7 am. Local amateur Rifqi Alam came in one shot back to take third place with Victor Osterby of Denmark and Thailand’s Panuwat Muenlek while another local prospect Indra Hermawan signed for a 69 to sit in sixth alongside Toni Ferrer of Spain and American Micah Lauren Shin. Kevin, who joined the play-for-pay ranks at the start of the year, surprised even himself when he fired one eagle and four birdies against two bogeys to take the clubhouse lead. “I honestly do not have any high expectations. I didn’t get much sleep last night. I just tried to stay patient because it’s easy to get frustrated on this course with the way the greens are sloped,” said Kevin, who rammed in a 40-foot eagle putt on par-five 16. “I hit a good tee shot which left me with a seven-iron for my second shot. I hit it just short of the front edge of the green and holed about a 40-foot putt for the eagle,” added the 24-year-old Thai. Kevin, who came through the Asian Tour Qualifying School earlier in January, credited his solid drives for a commendable start to his campaign at the Combiphar Golf Invitational. “I drove the ball well and put myself in good positions to try and make birdies. I did pretty well in limiting careless errors and avoided making bogeys. It’s important to hit as many fairways as you can because the course is very wet. You need to leave yourself with uphill putts with your approach shots too,” he said. Bogor, Indonesia, November 22 - Asian Development Tour (ADT) Order of Merit leader Johannes Veerman of the United States will challenge for a second title at ‘home’ when he steps up to the tee at the Combiphar Golf Invitational on Wednesday. The 22-year-old Texan, whose mother is Indonesian, will lead a host of up and coming players, including 25 ADT champions, to the inaugural US$60,000 event which will be held from November 23 to 26. Eight players from top-10 on the current ADT Order of Merit will also be part of the 132-man field from over 20 countries vying for honours at the Royal Tulip Gunung Geulis Golf Resorts in Bogor, a city in the West Java province of Indonesia. Veerman, who came through the Qualifying School earlier in January, enjoyed his best result on the Asian Tour when he finished tied-second at the BANK BRI-JCB Indonesia Open last week. He will be looking to continue his fine form when he returns to the ADT this week. “I have played a lot of tournaments on the ADT and there are a lot of great competition out here. All of that playing experiences and practices on the ADT have been polishing my game,” said Veerman, who claimed his maiden ADT win in Chinese Taipei in July. “There are a lot of talented players out here. I have been playing great so far this season. Golf is a long and hard road. You need to keep playing well to stay up there. Winning in Chinese Taipei earlier was a confidence booster for me,” he added. Veerman will feature in the Combiphar Golf Invitational alongside Malaysia’s Gavin Green, Sweden’s Oscar Zetterwall and Itthipat Buranatanyarat of Thailand, placed second, fourth and fifth respectively on the Order of Merit. George Gandranata, the first and only Indonesian to win on the ADT, will spearhead the home charge alongside Ian Andrew, Jordan Irawan and Danny Masrin, who emerged as the best Indonesian in tied-14th place at the recently-concluded Indonesia Open. Almay Rayhan Yaqutah, who was the best amateur in tied-27th place at the Indonesia Open, will get another chance to play against the big boys in the Combiphar Golf Invitational, what is the Tour’s second stop in Indonesia this season. Other notable players in the field include Asian Tour stalwart Antonio Lascuna of the Philippines, Steve Lewton of England, a one-time winner on the region’s premier Tour, as well as American Brett Munson. The top-five finishers on the final Order of Merit will secure their Asian Tour cards for 2017.